Is a British actor our new Supergirl? Photos show Pirates of the Caribbean 5 beginning to build sets in Australia. The Last Ship adds to its medical crew. And get a look at Hayley Atwell and Enver Gjokaj in action in Agent Carter. Plus, look ahead to the returning Arrow, Flash, and Once Upon a Time. Spoilers now! Take this all as unsourced rumors, but Christian Today reports a rumor that production problems, and the producers' unwillingness to rush anything, mean that the fifth season's premiere will be delayed from this spring to some later date. They add that casting for new characters has been put on hold. WENTWORTH MILLER AND DOMINIC PURCELL ("PRISON BREAK") TEAM UP AGAIN AS CAPTAIN COLD AND HEAT WAVE CHALLENGE THE FLASH TO AN EPIC BATTLE — Leonard Snart AKA Captain Cold (guest star Wentworth Miller) returns to Central City with a new hotheaded partner in tow – Mick Rory AKA Heat Wave (guest star Dominic Purcell). The duo plan to steal a multi-million dollar painting, but Cold has another agenda while in town – to set a trap for The Flash. 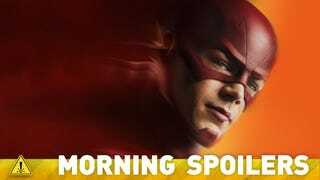 Snart and Mick kidnap someone close to The Flash and threaten to kill them unless The Flash shows up for a battle of fire and ice. Barry tells Joe (Jesse L. Martin) he isn't sure he should take on Snart again after the casualties that happened the last time they fought. Meanwhile, Barry asks Dr. Wells (Tom Cavanagh), Caitlin (Danielle Panabaker) and Cisco (Carlos Valdes) to help him double his training efforts so he's ready for the Reverse Flash when he returns to Central City. Iris (Candice Patton) deals with the aftermath of Barry's confession, and Cisco makes the CCPD a new shield. Nick Copus directed the episode written by Geoff Johns & Kai Yu Wu (#110). Original airdate 1/20/2015. THE TEAM DEALS WITH OLIVER'S DISAPPEARANCE — In the aftermath of Oliver's (Stephen Amell) fight with Ra's al Ghul (Matt Nable), Diggle (David Ramsey) and Arsenal (Colton Haynes) continue to protect the city in the Arrow's absence. However, after three days without hearing from Oliver, they begin to fear the worst may have happened to their friend. Felicity (Emily Bett Rickards) refuses to believe that Oliver could be dead until Merlyn (John Barrowman) pays the team a surprise visit. Thea (Willa Holland) suspects there is something more behind Oliver's disappearance and asks Merlyn for a favor. Meanwhile, Ray (Brandon Routh) tests a part of his new suit and Laurel (Katie Cassidy) takes up the mantle of the Black Canary. Glen Winter directed the episode written by Marc Guggenheim & Erik Oleson (#310). Original airdate 1/21/2015. Here's a sneak peek from Sunday's episode, "Prophecy:"